L&M Keating have clinched two awards over the weekend at the Association of Consulting Engineers of Ireland Annual Awards 2016 and the Irish Concrete Society Annual Awards with two recent Design Build Marine Civil Engineering Projects. Haulbowline Bridge Post-tensioned Bridge Rehabilitation in conjunction with RPS, Cork and Cape Clear Island Storm Island Storm Gate Project were up for awards. The Best Medium Sized Structure award went to O’Connor Sutton Cronin, Galway for their work as our Structural and Civil Engineering Consultant to the Cape Clear Island Harbour Storm Gate Project at the Engineers awards on Friday. On Saturday night, the team attended the Irish Concrete Society Annual Awards where it had two entries, N4 Hughes Bridge with Arup Consulting Engineers and Doolin Pier with Malachy Walsh & Partners. The Doolin Pier Project took the national title for Best Infrastructural Project 2016. 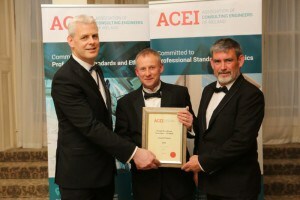 Kevin Rudden ACEI, Andrew McDermott OCSC & Louis Keating L&M Keating at the ACEI Awards. The awards recognise the truly innovative approach of the company. In Cape Clear L&M Keating floated a 1000t reinforced concrete lock chamber over 100km from Verolme Drydock, Cobh to Cape Clear Island Harbour. The chamber houses new CE marked 140t hydraulic gates which when closed provide shelter to the harbour during storms. In particular this award recognises the intricate structural design of the reinforced lock chamber. The company is extremely proud that its specialist consultants, O’Connor Sutton Cronin and the L&M Keating team have gained this prestigious title for this totally innovative solution. 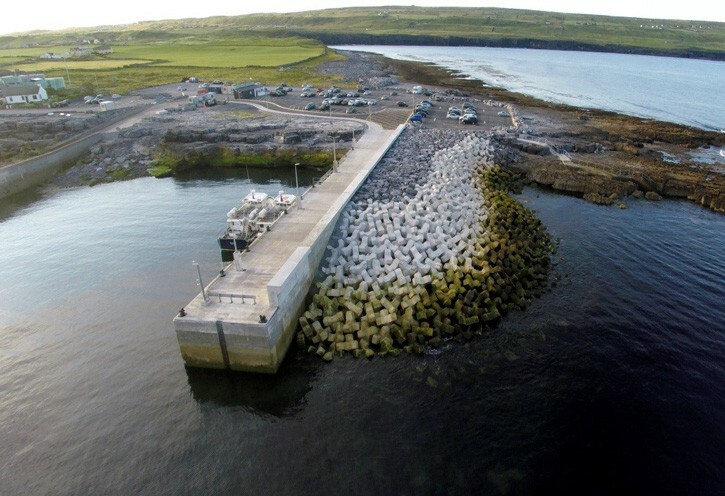 On the Doolin Pier project the company developed an entirely new precast pier construction concept. The concept facilitated the safe construction of a new 65m pier and harbour on the wild Atlantic Coast. Using contractor designed 50t precast pier elements L&M Keating were able to construct the pier in a modular form. This minimised exposed site working hours and underwater working. An insitu 4m high fair faced concrete wave wall and rock armoured revetment with 420 10t xblocs units provide protection from Atlantic swells. The project is the result of successful collaboration between the L&M Keating Design Build team, our designers Malachy Walsh & Partners and suppliers Banagher Concrete, Ryan Quarries, McGrath Quarries & Cill Bhríde Teo. The project was constructed on behalf of Clare County Council represented by Punch & Partners.